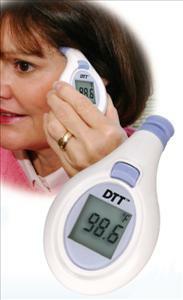 The new Medline Instant Read Digital Temple Thermometer accurately measure body heat using patented R.A.T.E. technology (Rapid Accurate Temperature Establishment). Sensors rapidly track the heat flow generated from blood vessels to the skin's surface and convert measurement to body temperature, meeting accuracy standards. Because it is non-invasive, it is easy to use asleep or awake. It features a large digital display, an audible beep when ready, and a memory that recalls previous temperature reading.